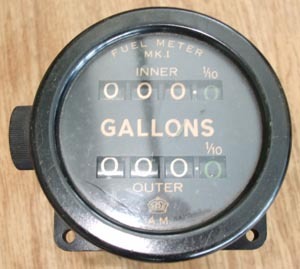 Fuel gauges are always type specific. Each aircraft has different fuel requirements and therefore they have specifically made fuel gauges. 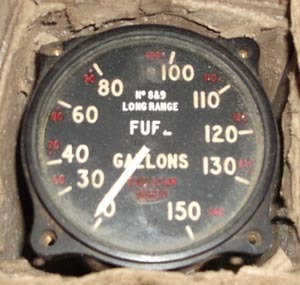 Fighters in general tend to have one where as bombers may have several. 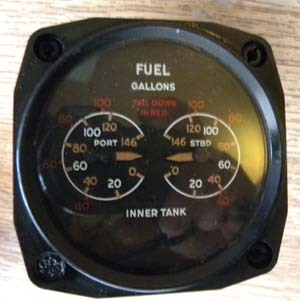 Fighter gauges can measure more than one tank and sometimes have buttons next to them on the instrument panel which when depressed show the fuel contents of another tank. 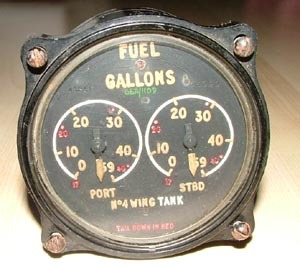 Large aircraft and bombers usually do not have fuel gauges on their main panels but mostly are fitted to the flight engineers panel. 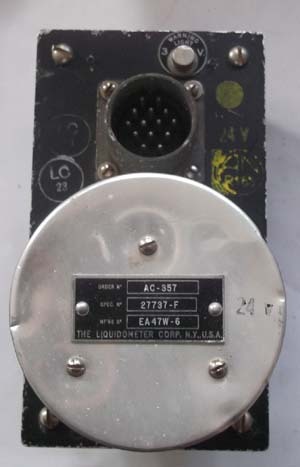 So if you are looking for a part which is definitely from a specific aircraft these are suitable. 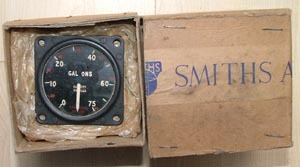 A very rare Smith's A1 condition fuel gauge for the famous Bristol Blenheim. Complete with mounting ring. 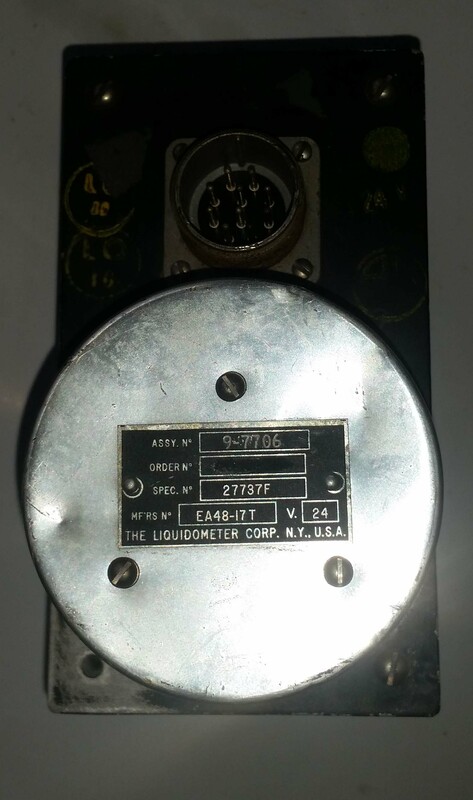 The pictures are poor the glass and face is clear. The Spitfire is normally at 37 gallon tank but as this is 38 gallons and 12 volt would be suitable for the Spitfire 100% original in good used condition. 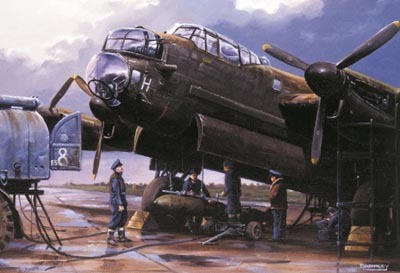 By the time of the 1,000-bomber raids of May/June 1942, the Hampden was nearing the end of its service with Bomber Command and the final operation by Hampdens took place in mid-September 1942 when No 408 Squadron RCAF were in action over Wilhelmshaven. 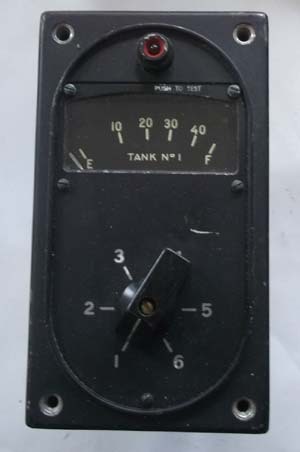 A superb Hampden fuel gauge very rare known examples number only a very few world wide. 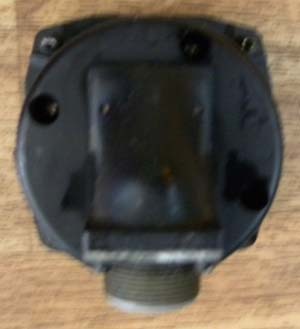 A very early example which appears to be in working order. 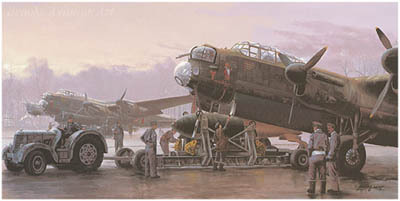 Hampdens joined the first Bomber Command daylight operation of the war when aircraft of No 83 Squadron (one of which was piloted by Guy Gibson) joined an attack on German naval vessels in the Schillig Roads along with Wellingtons and Blenheims.The first two VCs awarded to Bomber Command personnel were to Hampden crew-members. 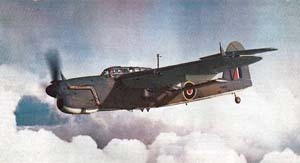 Hampdens had found a new lease of life as torpedo-bombers with Coastal Command and operated as such until the end of 1943. 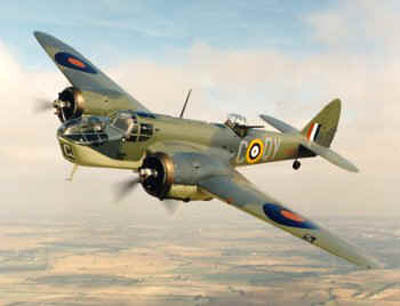 These were the last operations of the 1,453 Hampdens to serve with the RAF. 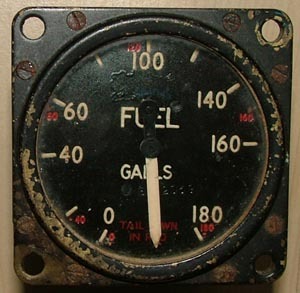 Boxed fuel gauge for the Beaufighter dated on the box the 9th March 1944. 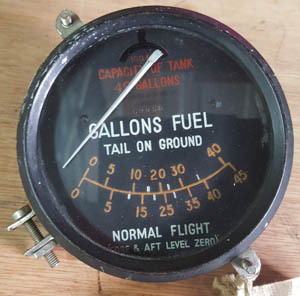 So far I am unable to identify the aircraft this fuel gauge was used in. 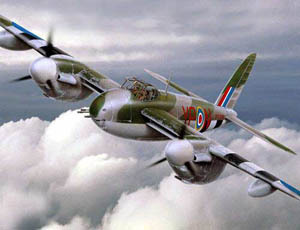 In excellent condition its similar in style to the Mosquito as shown above. 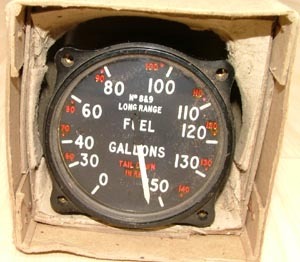 FG 553 Inner trailing 114 gallon fuel gauge. 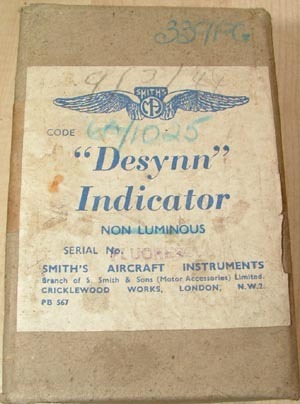 The RAF received its first Sunderland Mark I in June 1938, when the second production aircraft was flown to Singapore. 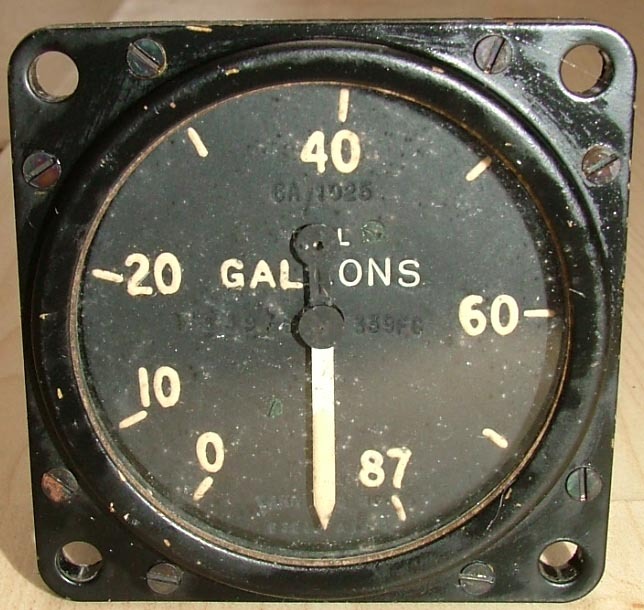 By the outbreak of war in Europe in September 1939, the RAF Coastal Command was operating 40 Sunderland's. 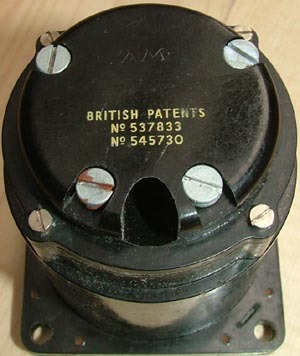 Although British antisubmarine efforts were disorganized and ineffectual at first, Sunderland's quickly proved useful in the rescue of crews of torpedoed ships. 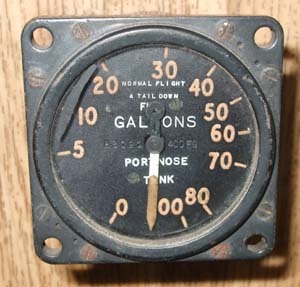 On 21 September 1939, two Sunderland's rescued the entire 34 man crew of the torpedoed merchantman KENSINGTON COURT from the North Sea. 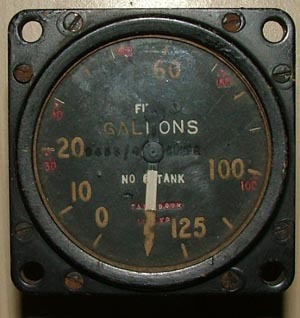 As British antisubmarine measures improved, the Sunderland began to show its claws as well. 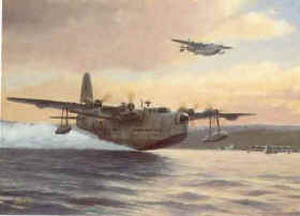 A Royal Australian Air Force (RAAF) Sunderland performed the type's first unassisted kill of a U-boat on 17 July 1940. 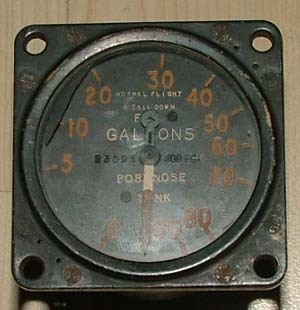 As the British honed their combat skills, the Sunderland Mark I received various improvements to make it more effective. 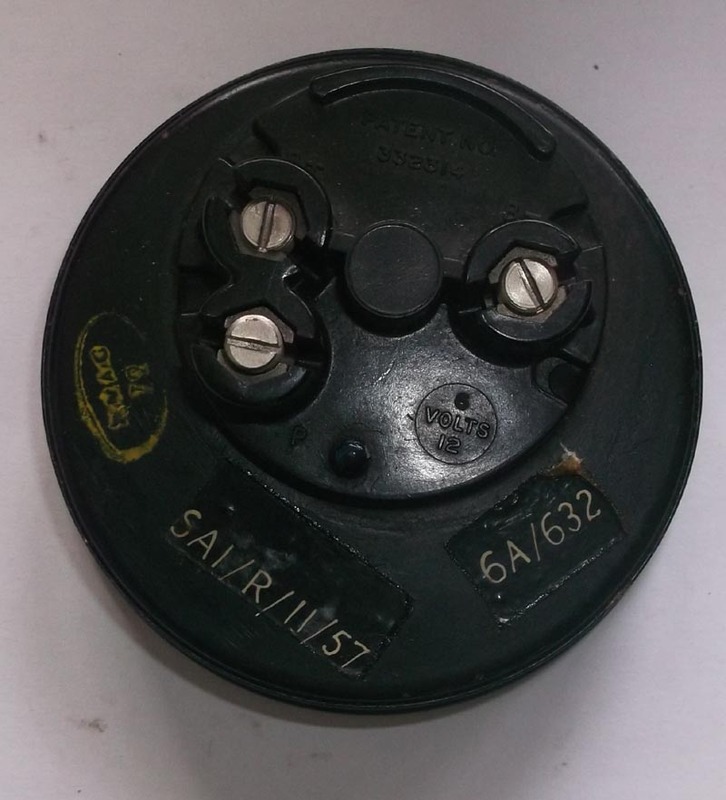 The nose turret was upgraded to two 7.7 millimetre guns instead of one. 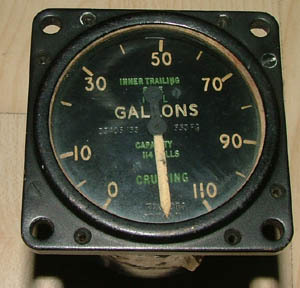 New propellers, and pneumatic rubber wing de-icing boots, were fitted as well. 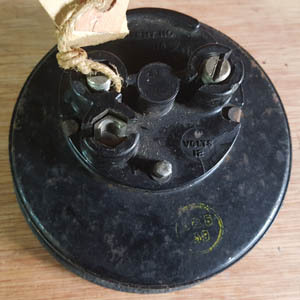 Although the 7.7 millimetre guns lacked range and hitting power and the British would in time understand the need for more formidable weapons, the Sunderland had a fair number of them, and it was a well-built machine that was hard to destroy. 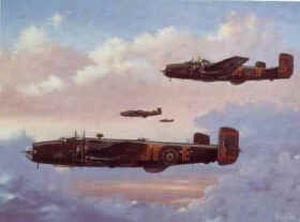 On 3 April 1940, a Sunderland operating off Norway was attacked by six German Junkers Ju-88 fighters, and managed to shoot one down, damage another enough to send it off to a forced landing, and drive off the rest. 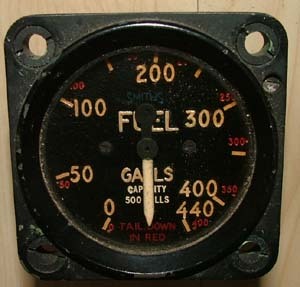 The Germans were supposed to have nicknamed the Sunderland the "Fliegende Stachelsweine (Flying Porcupine)". 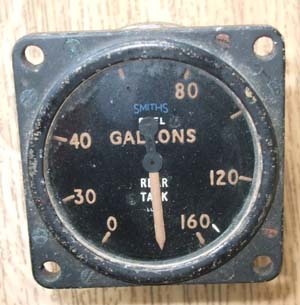 Nice condition fuel gauge for the Avro York. 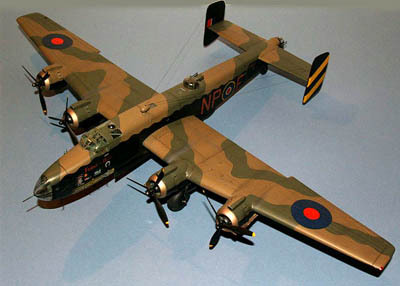 Manufactured by Avro and incorporating the wings, tail, undercarriage and engines of the Lancaster bomber, the York was to prove a useful military and civilian transport aircraft in war and peace. 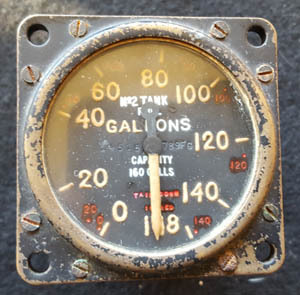 A nice fuel tank gauge for a Wellington Bomber 160 Gallons. Good condition Wartime heavy Bomber Fuel gauge. This a fuel gauge for a Lancaster marked to 500gallons, the tank actually held about 580 gallons. 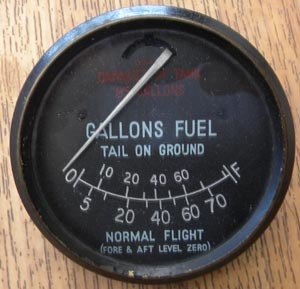 This instrument being a fuel gauge is unique to the Lancaster. 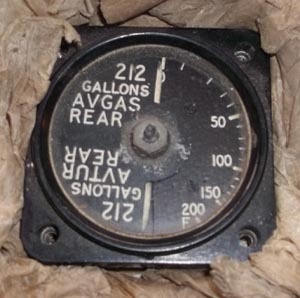 A really nice Wartime fuel gauge. 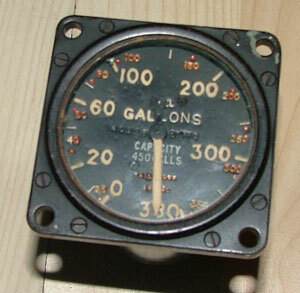 A really nice Wartime fuel gauge for an Airspeed Oxford complete with its original mounting bracket . 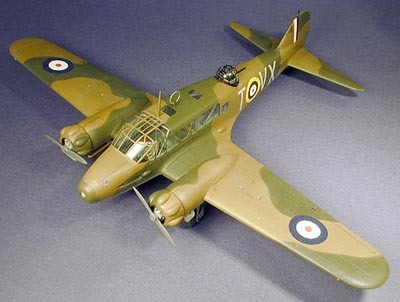 The most prominent of the British twin-engine utility aircraft during the war were the Avro "Anson" and Airspeed "Oxford", which were built in large quantity, and served in a number of roles. Shown below the Airspeed oxford. Possibly one of the rarest fuel gauge I have a totally original 48 gallon Fuel gauge fitted to the PRU Spitfire and the Seafire MK II and III. 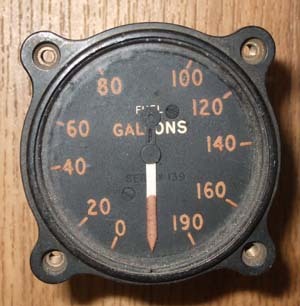 It was also used as the second fuel gauge on the MK I Spitfire. 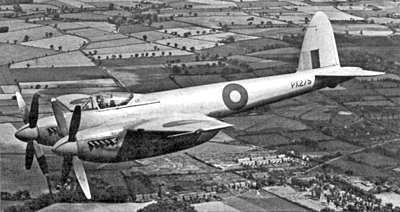 The PRU Spitfire spent most of its time at altitudes of around 25,000-30,000 feet and belonged to the Photographic Reconnaissance Unit (PRU) stationed at RAF Benson near Wallingford in Oxfordshire. 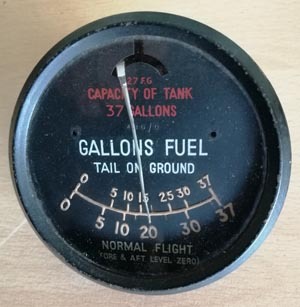 It had hollow wings filled with petrol, about 66 gallons each side, and when these tanks were full, the fuel could often be seen dripping from the wing tips. 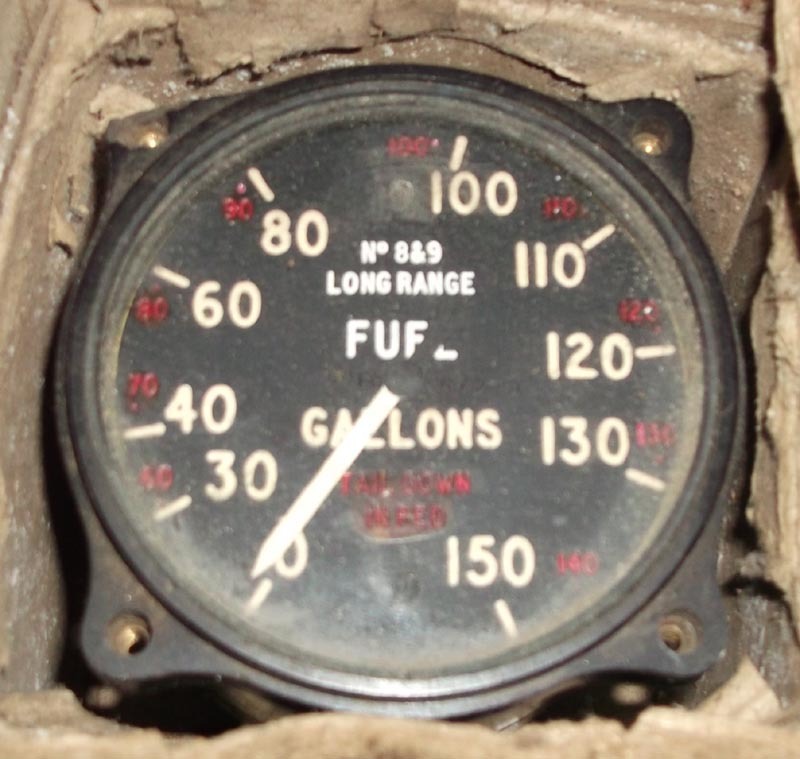 It could well be described as a flying Bowser. 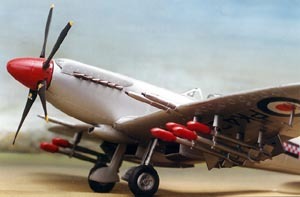 The PRU Spitfire was provided with the Mark XI engine in 1943, which produced great changes. 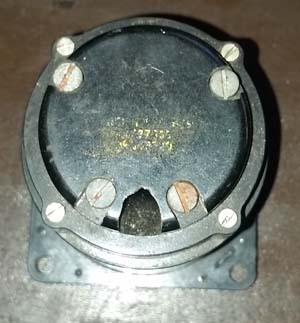 These upgraded engines, with two stage superchargers, which automatically cut in at about 20,000 feet, increased its average flying speed to about 340-360 mph. 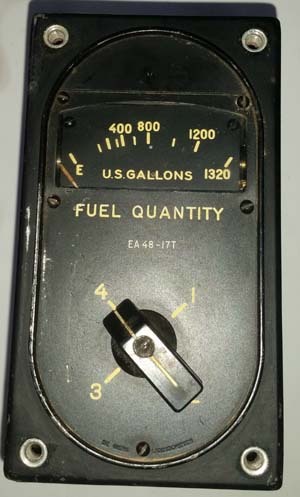 On the debit side, petrol consumption increased substantially, and to offset this, if long flights were envisaged, the aircraft could be fitted with disposable drop-tanks. 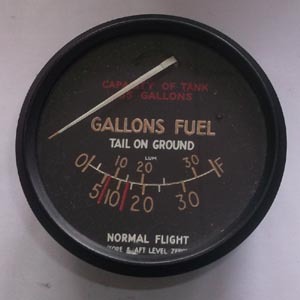 These contained additional fuel of 45 or 90 gallons. 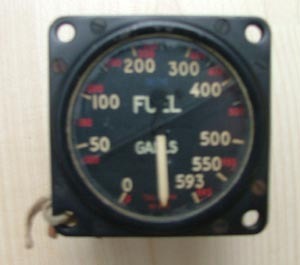 The latter were not popular with pilots, as they made a Spitfire unstable, and were regarded as hazardous on take-off. 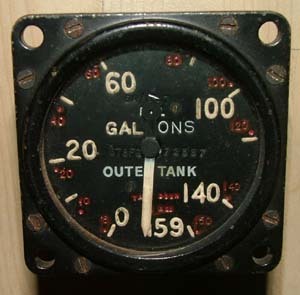 The routine was to use the fuel in these tanks first, after which they were jettisoned, no doubt to the surprise of the unsuspecting public of the Third Reich. 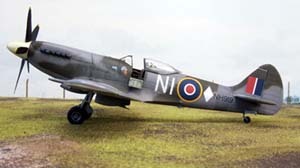 After these modifications, it was possible for a Spitfire to achieve a return journey to Berlin in just over 4 and 1/2 hours. 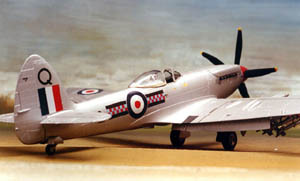 The Supermarine Seafire was a development of the Spitfire to generate a high performance carrier-based fighter aircraft. 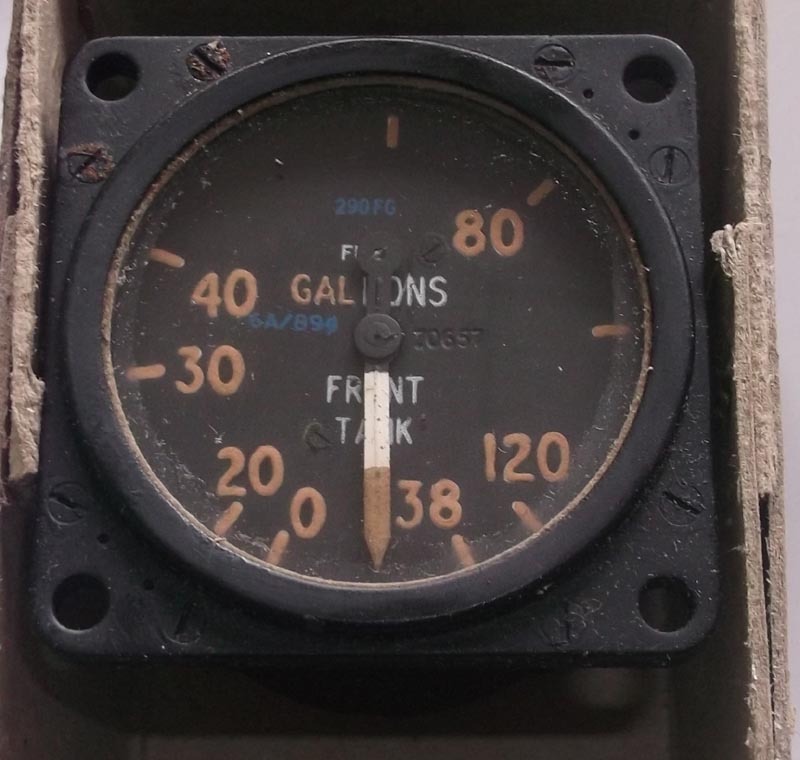 It is interesting to see the Spitfire evolution from MK1 to F22 and the changes in fuel gauges listed under. 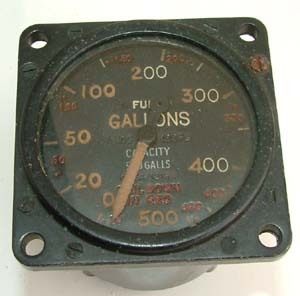 This is a 37gallon fuel gauge for the Spitfire only. The gauge itself is 100% original but has a new made reproduction face. 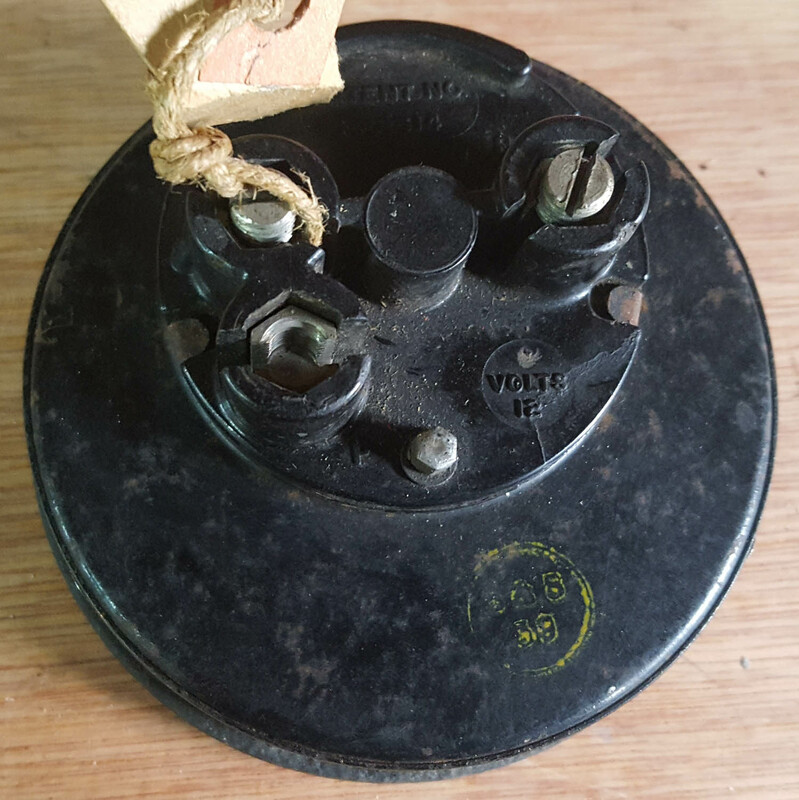 Comes complete with its mounting bracket. 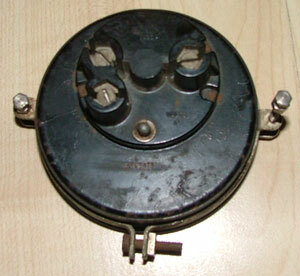 It is a 12volt model as it should be being fitted to every MK of Spitfire until being replaced in the MK XIV onwards. This is a really superb rectangular type fuel gauge specifically for the MK XIV Spitfire. This is an original fuel gauge made specifically for the MK 21 and MK 22 Spitfire the last in a long line of this superb iconic aircraft. 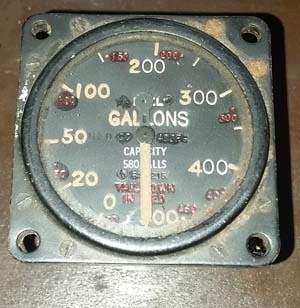 This gauge is in good condition and should be serviceable. 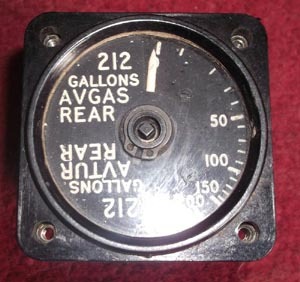 Made for the Avro Anson but very similar to the Hurricane fuel gauge. 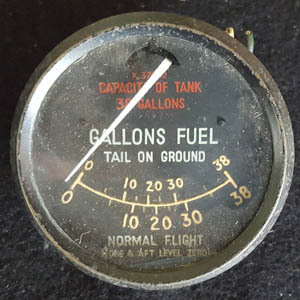 This is a very rare piece indeed this is fuel gauge for a Hornet. 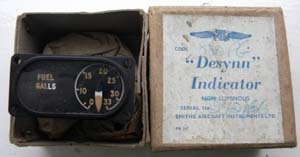 The de Havilland DH.103 Hornet was a piston engine fighter that further exploited the wooden construction techniques pioneered by the classic Mosquito. 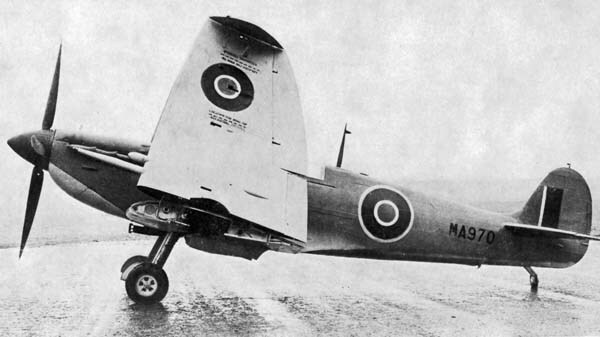 Entering service at the end of the WWII, the Hornet equipped post war RAF Fighter Command day fighter units in the UK and was later used successfully as a strike fighter in Malaya. 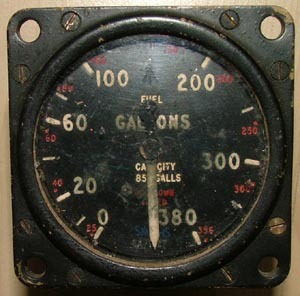 The Sea Hornet was a carrier-capable version. Does exactly what it says, this is meter which measured the amount of fuel filling the tanks of Heavy Bombers like the Lancaster. Nice original condition air ministry marked. 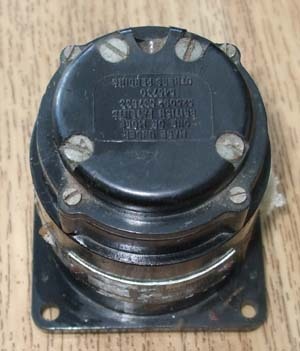 For one Halifax crew on 6 October 1944, the presence of 610 Squadron�s Spitfires became a godsend. 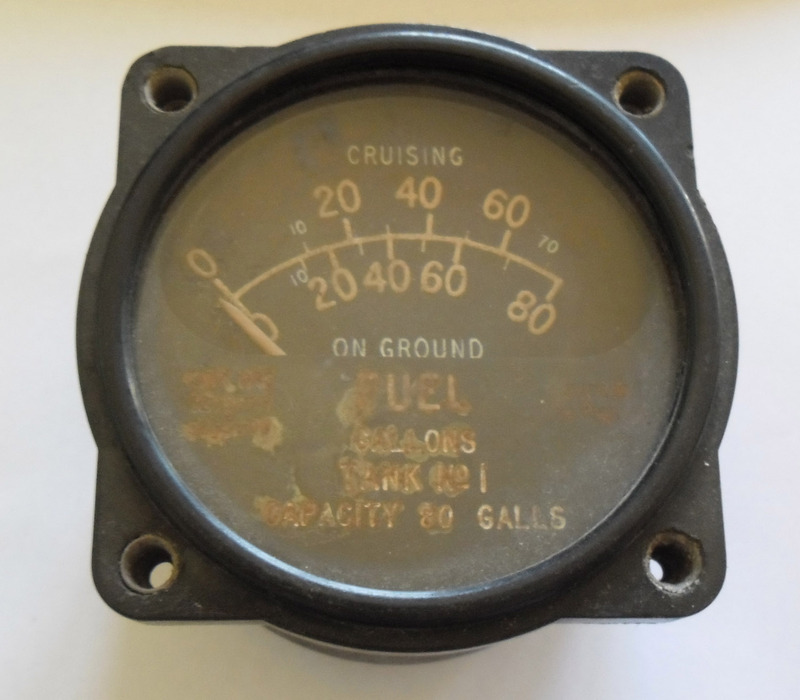 A very unusual and interesting fuel gauge from a Sea Otter. 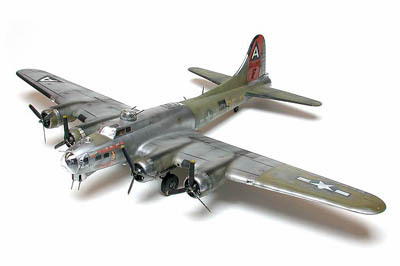 No complete examples of this aircraft have survived. 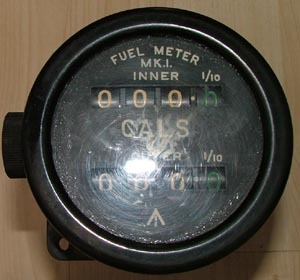 The Sea Otter was broadly based on the Walrus, with a tractor engine and more refined construction. 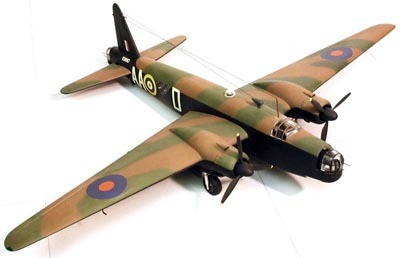 It could be either Carrier or shore based and served with the RAF Coastal Command and the Fleet Air Arm. It consisted of two marks, Mk I Amphibian with optional under wing bombs or depth charges and the A.S.R. 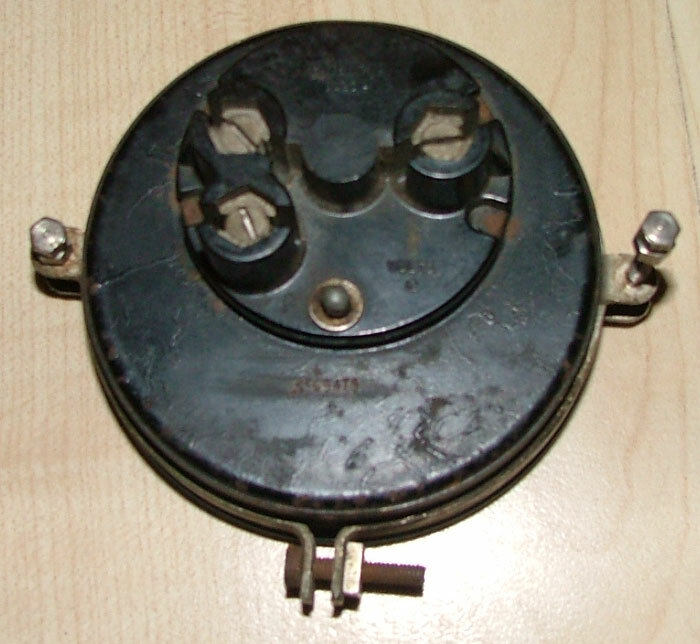 Mk II Air/Sea rescue version. 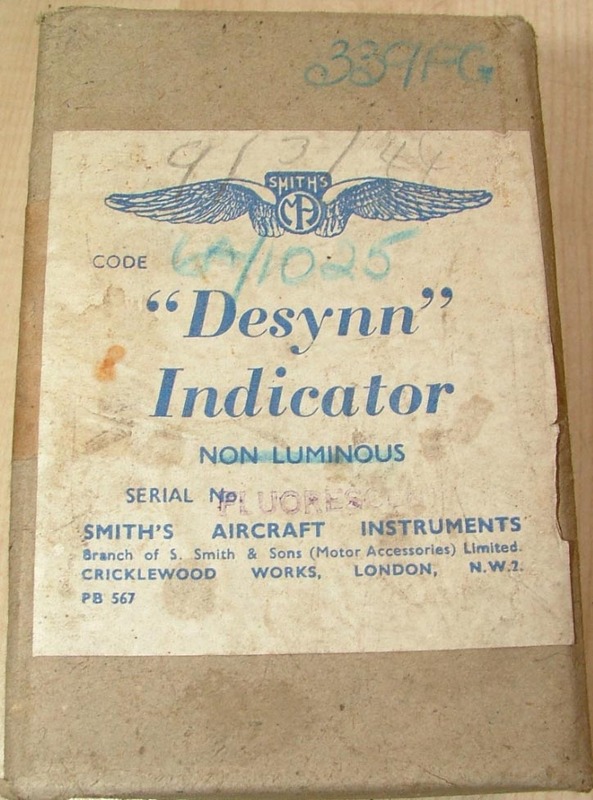 The first production aircraft was delivered in August 1943, and a total of 4 had been delivered by the end of the year, the rest been delivered in 1944 and 1945. 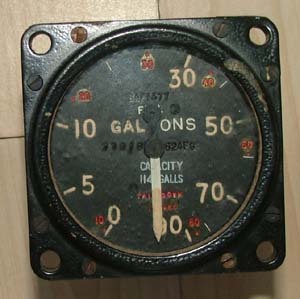 The Sea Otter was the last biplane to enter RAF and FAA service in 1944. 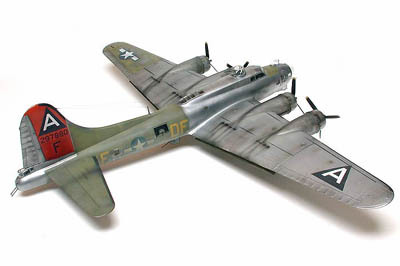 A total of 292 were built mainly for the FAA although only 94 had been delivered by August 1945. This fuel gauge was used on the Lancaster's engineers panel. 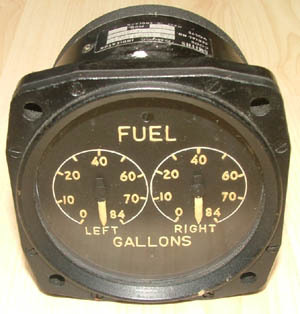 Fuel gauge as fitted to the engineers panel of the Lancaster. Looks very similar to a Mosquito fuel gauge but the FG number is not on my list so I cannot say what aircraft it was fitted to,, but it is from a tail dragger. 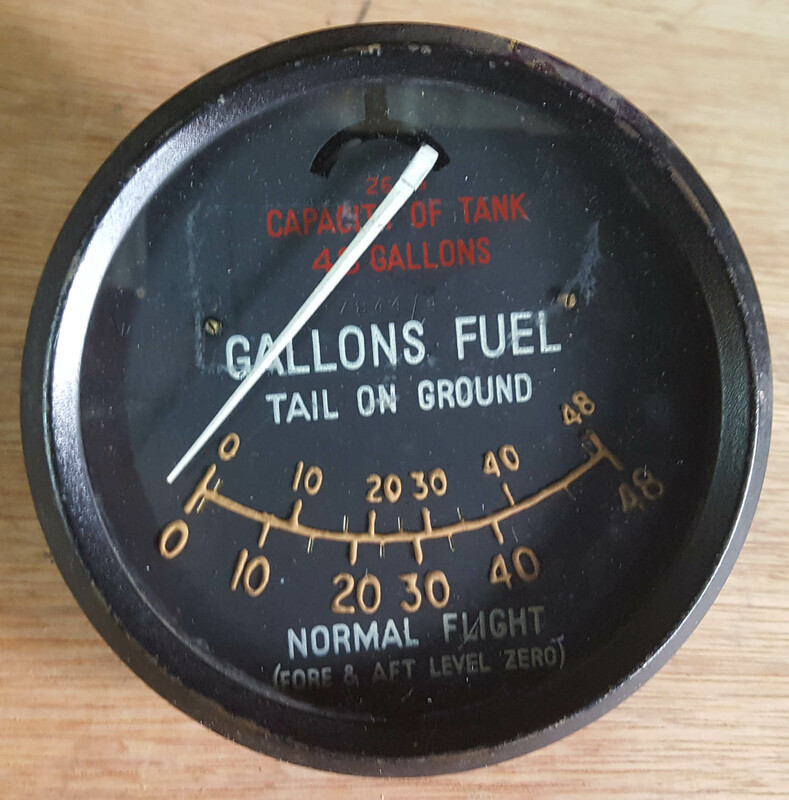 Mosquito nos 4 wing tank in nice condition. 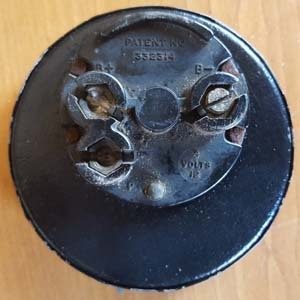 Hairline crack in glass, probably from a heavy bomber. 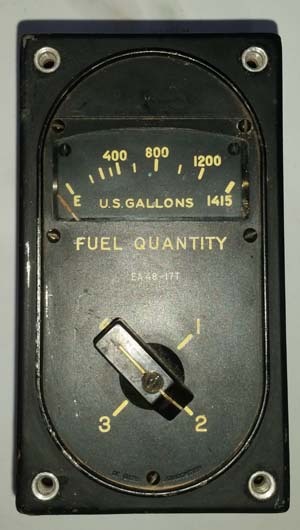 Early wartime fuel meter .Used by the RAF tankers to measure the transfer of fuel to Heavy bombers. 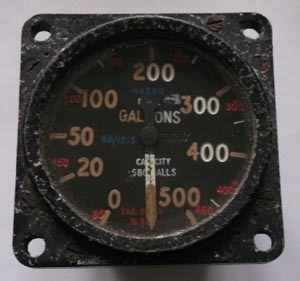 Port Nose Fuel tank gauge from a Halifax bomber. 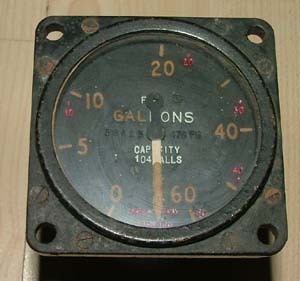 Nos 6 Fuel tank gauge from a Halifax bomber. 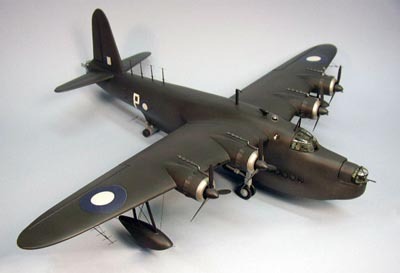 WW2 the Australian built Beaufort was perhaps the most important RAAF medium bomber. A Really nice fuel gauge from the Royal Australian Air Force. 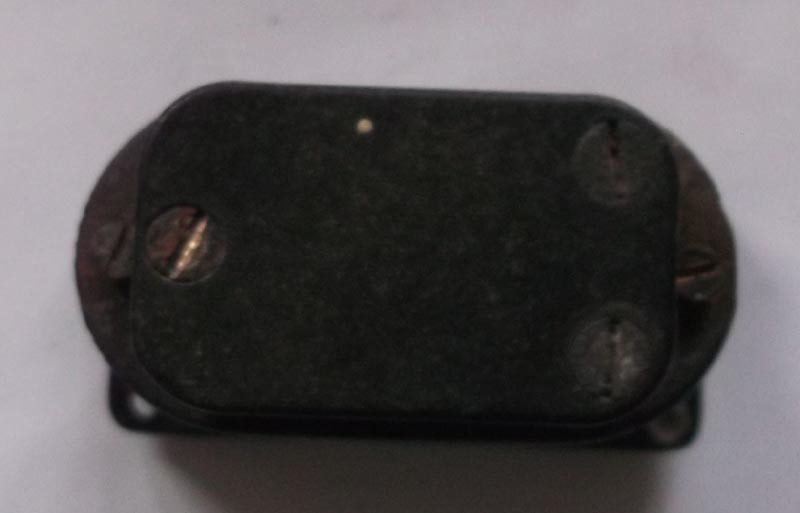 6a/3274 from a DAP Beaufort. 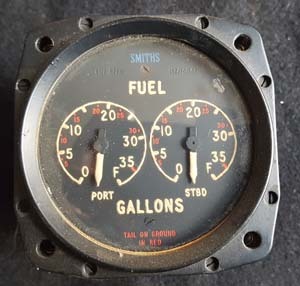 180 Gallon fuel gauge by Smiths. Nice condition Av Gas 212 gallon fuel gauge. 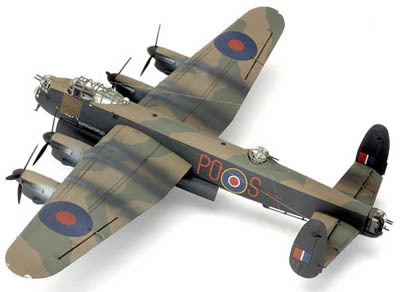 Designed as a fast, light twin-engine bomber. 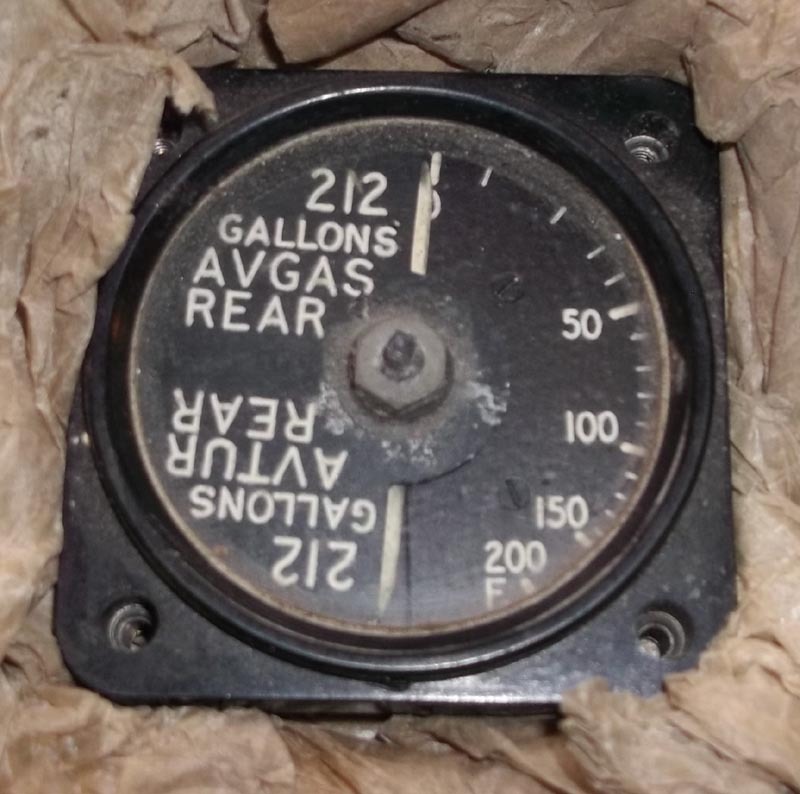 Delivery was delayed because the engines were unavailable. Handling was poor, and performance unimpressive. 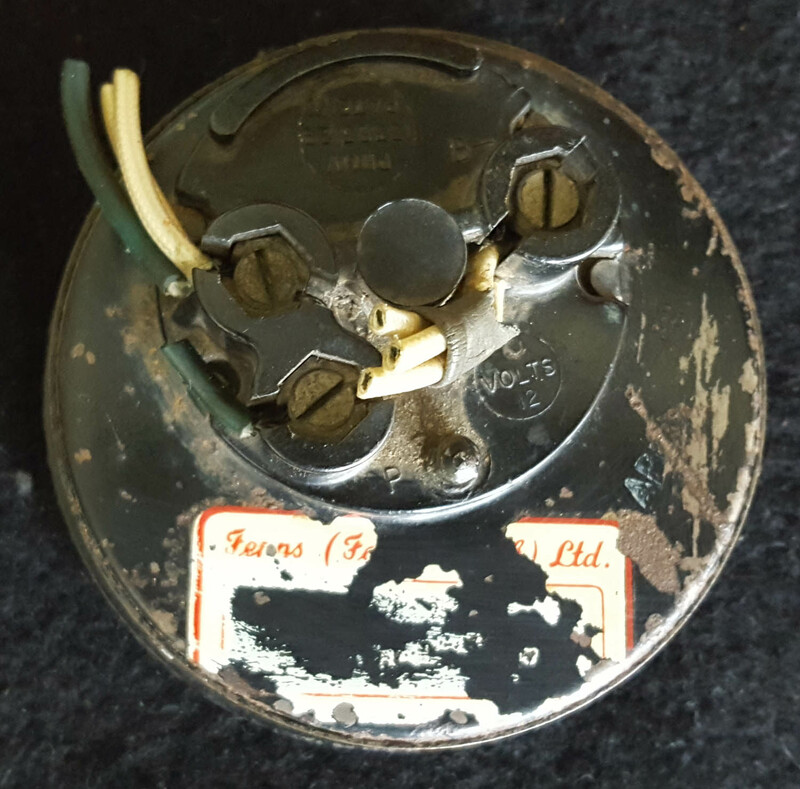 The operational need for them had disappeared when they were delivered. The Buckingham was mainly used as fast transport. 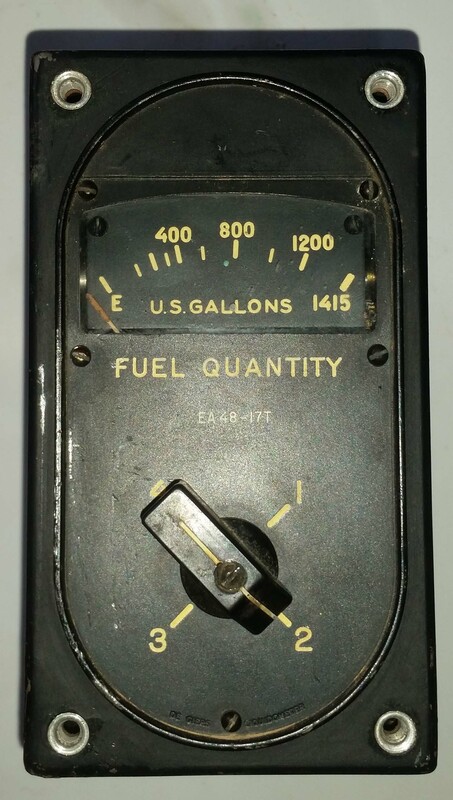 Outer tank 159 gallon fuel gauge . 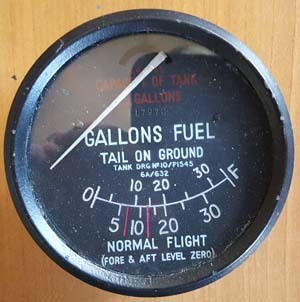 90 gallon fuel gauge fitted to the Barracuda. Boxed in mint condition there are no surviving Barracudas in existence today. 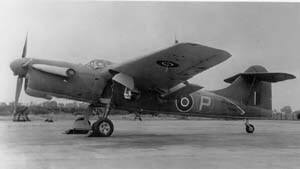 First flown in December 1940, the Fairey Barracuda torpedo bomber was designed to replace the obsolete Fairey Swordfish and Albacore biplanes as a front-line combat aircraft. 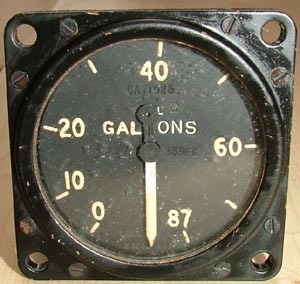 Production and other delays however meant the aircraft type did not begin to see widespread service until 1943. The Barracuda then served in a wide variety of capacities until VJ Day. 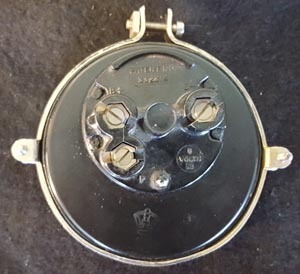 The design achieved prominence in 1944 when forty Barracudas took off in two waves to successfully attack the German pocket battleship Tripitz anchored in a Norwegian fiord. 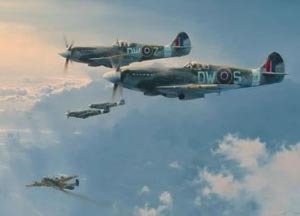 Several Canadian pilots were involved in this famous attack. 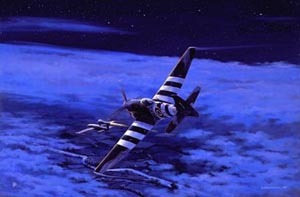 The Barracuda also saw numerous actions with the British fleet in the Pacific. 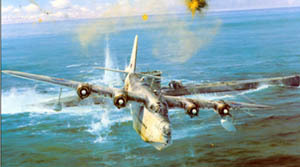 Despite its ungainly appearance, the aircraft could carry out a wide variety of missions and was progressively modified to carry bombs, mines, torpedoes, depth charges, rockets, radar masts and radomes, lifeboats and even containers under the wings for dropping agents into occupied territories. 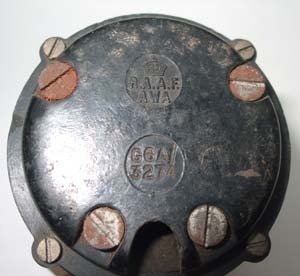 Two Royal Canadian Navy squadrons, Nos 825 and 826, were initially equipped with Barracudas when they were formed in 1945. 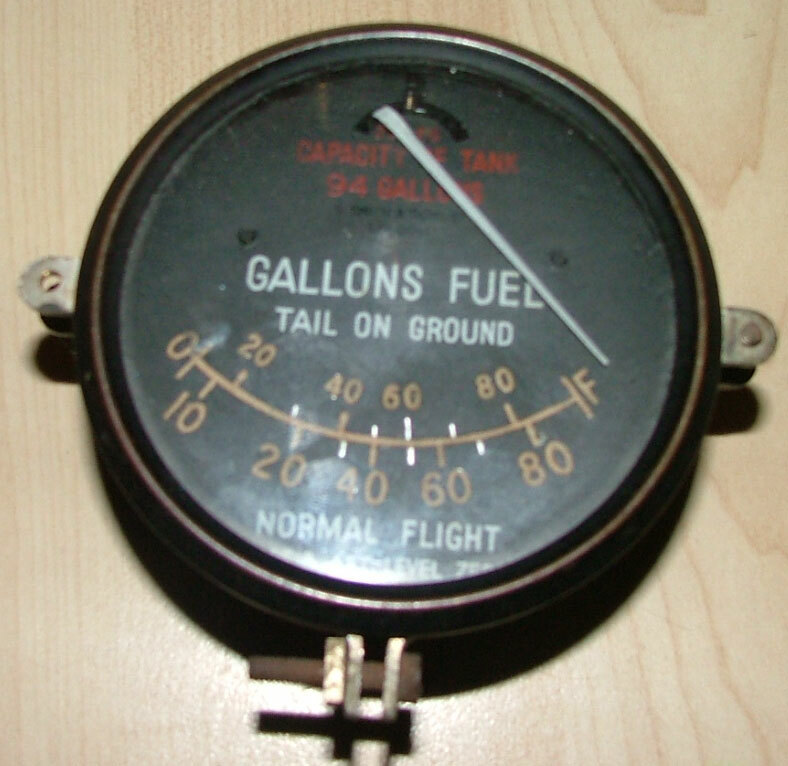 This is a fuel gauge from a Tempest MK II and also uses in the MK V.
Seen above a MK II Tempest. 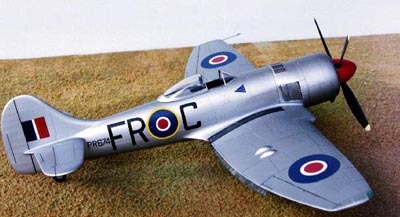 Pilots said that the Tempest was manoeuvrable, pleasant to fly, with no major handling faults. 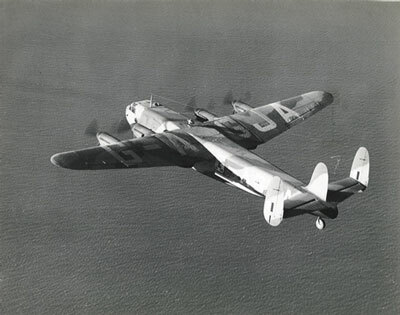 It was found that the Tempest could take a lot of hits and would still be flyable. 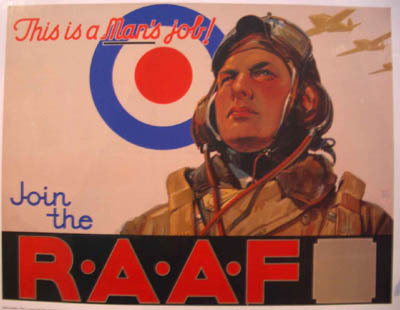 The top Tempest ace, with 11 aircraft kills, was the American D. C. Fairbanks who was a member of the RAF. 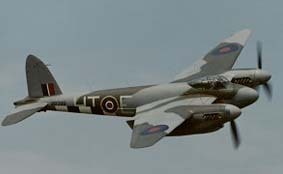 Tempest were used for taking down German V-1 rockets and are credited with 638 of the 1,771 destroyed. 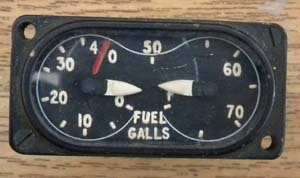 One Tempest pilot shot down 60. 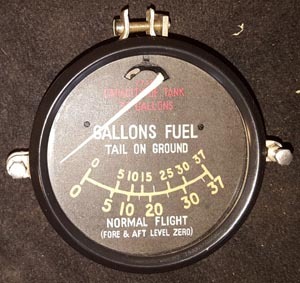 Some Tempests were equipped with additional fuel tanks so that they could stay in the air up to 4 1/2 hours waiting for V-1s. 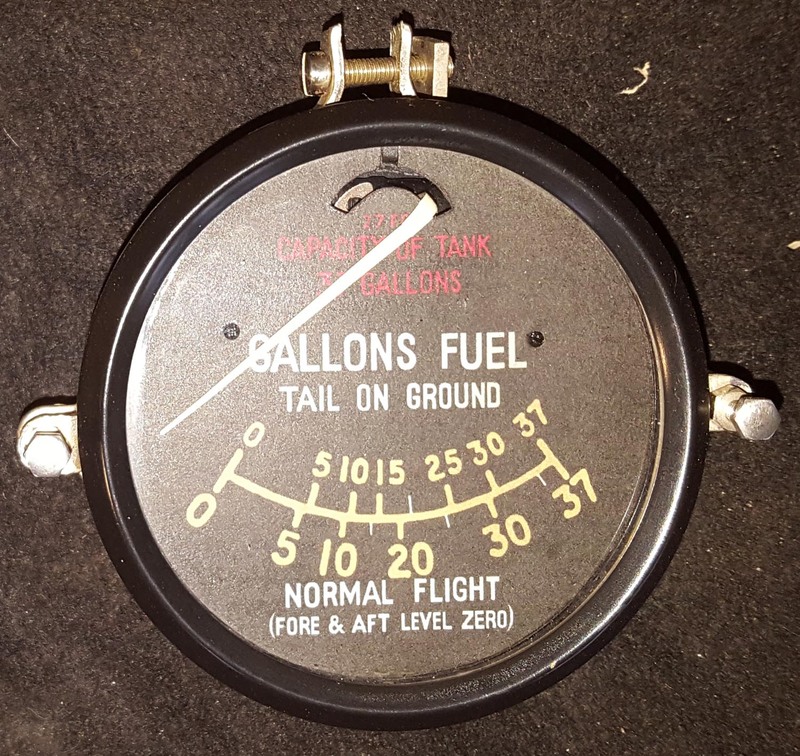 They would stay at around 10,000' waiting for ground radar stations to tell them where to go. 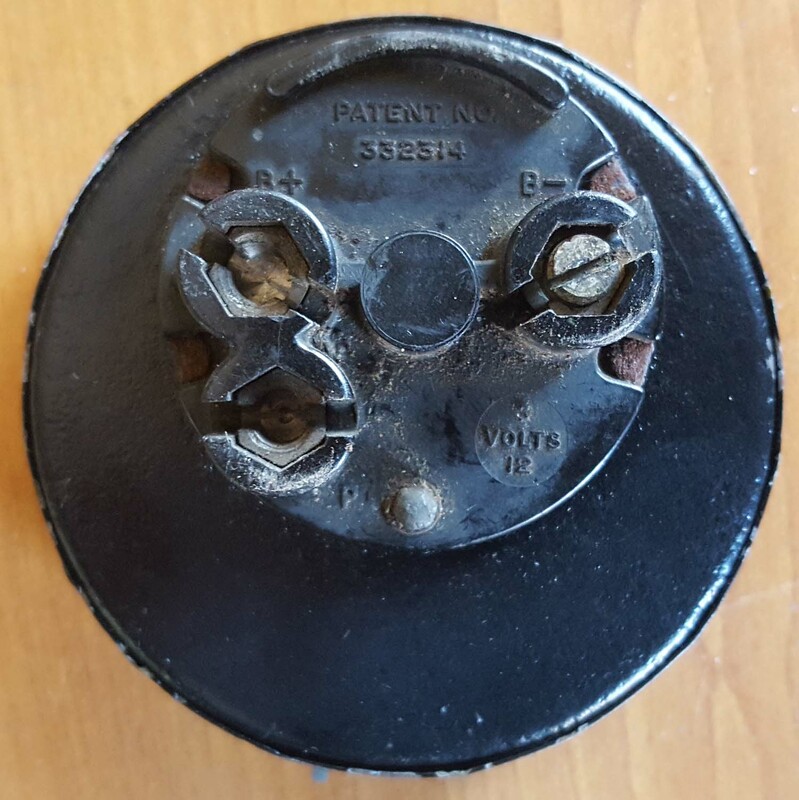 When out of ammunition a few pilots would try to flip the V-1 with their wing. 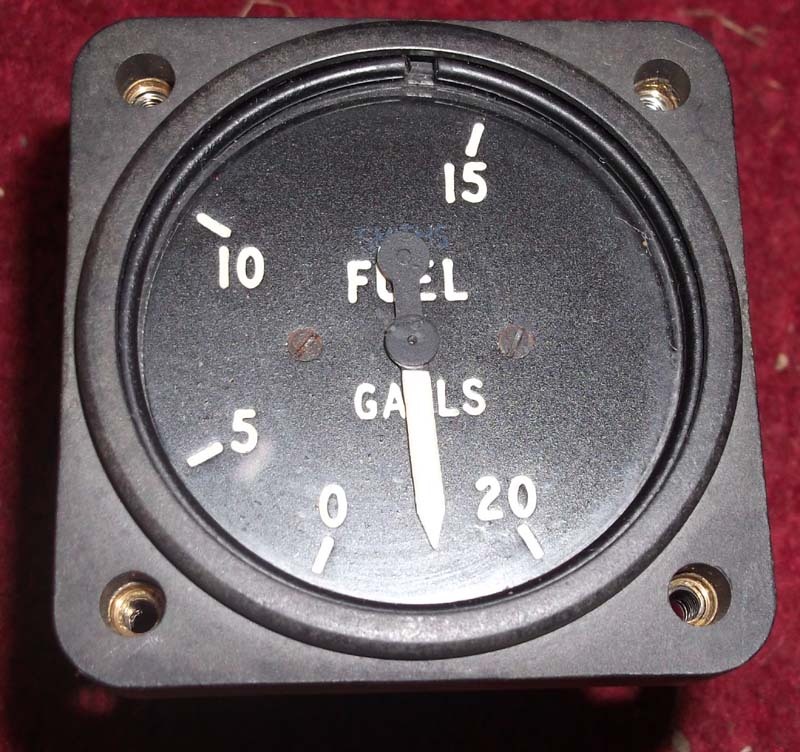 Here we have an Avro Anson fuel gauge in excellent condition. 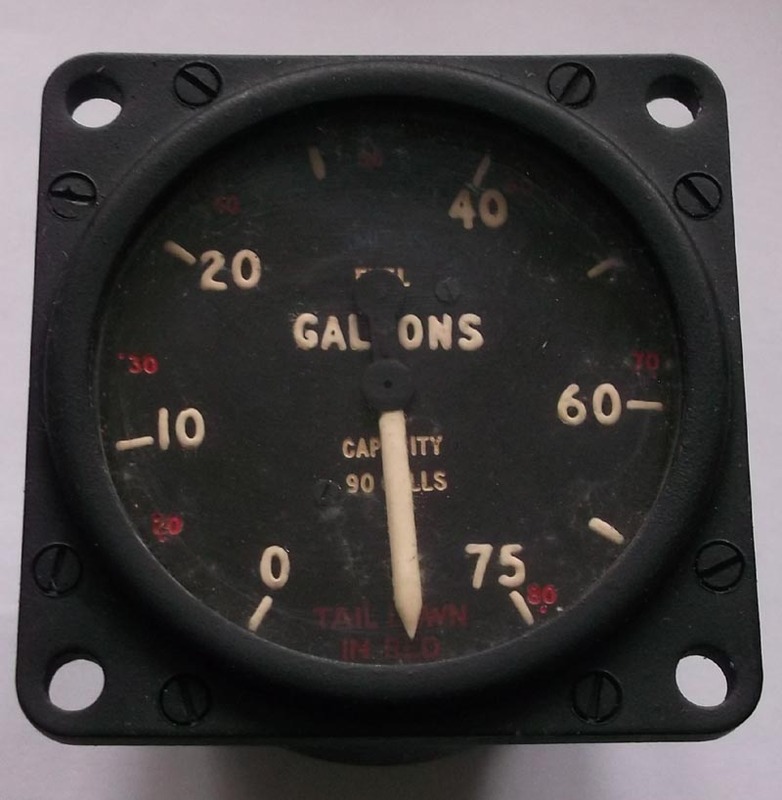 These gauges are very similar to the Spitfire and Hurricane gauges. 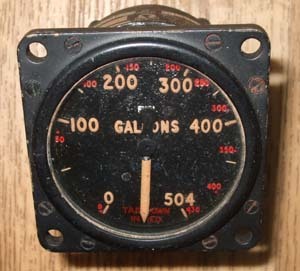 This type of gauge all worked on the same mechanism and calibration for different aircraft use they simply changed the face. 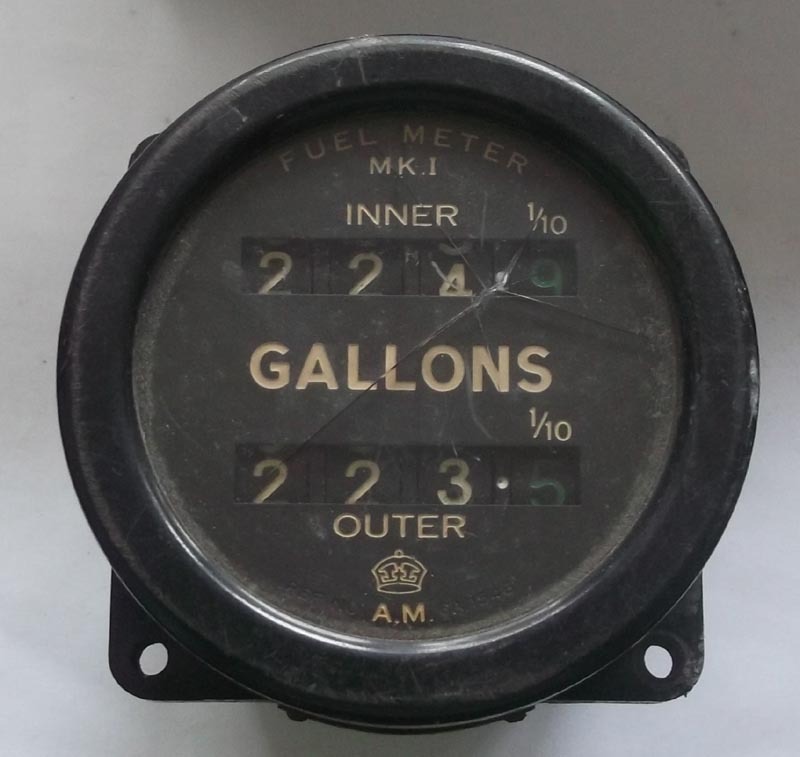 Early wartime MK I fuel meter .Used by the RAF tankers to measure the transfer of fuel to Heavy bombers. 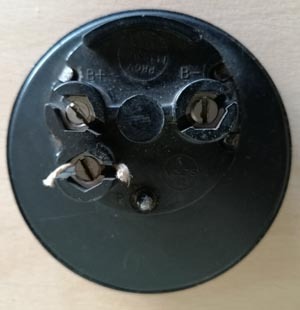 has a small crack to the glass. 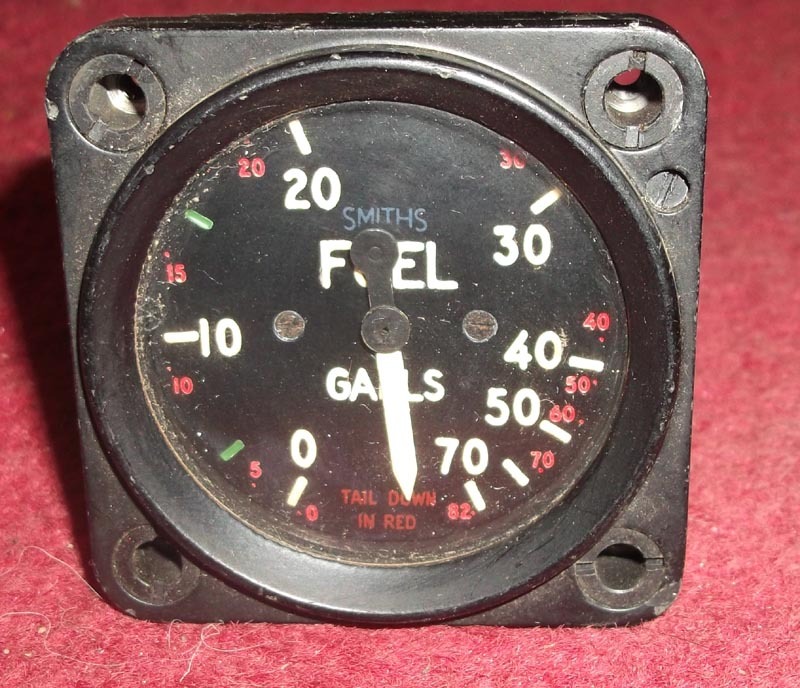 Superb condition fuel gauge from the famous Vickers Wellington one of the RAF first successful heavy Bombers designed by Barnes Wallis creator of the Dambuster bouncing bomb. 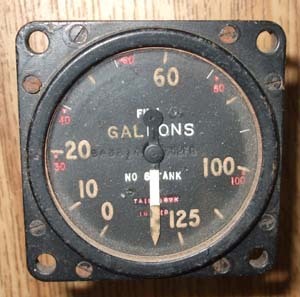 Original Wellington front fuel tank gauge. 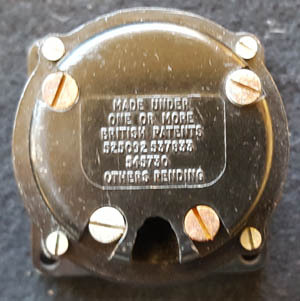 Multiples available. 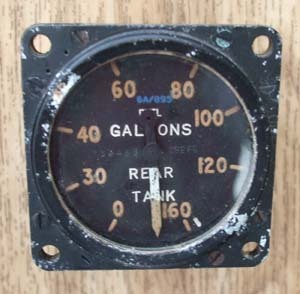 Original Lancaster 580 gallon fuel gauge fitted to the engineers panel. 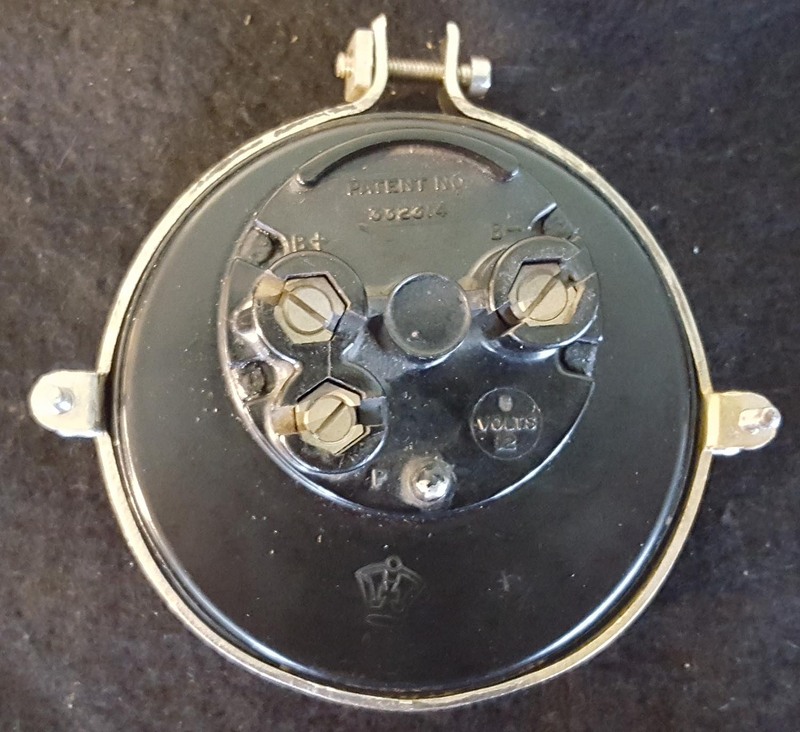 Multiples available. Nice AV GAS short for aviation fuel. I do not know the aircraft this was fitted in if you can help please contact me. Original in excellent condition a fuel gauge from the now extinct Barracuda. 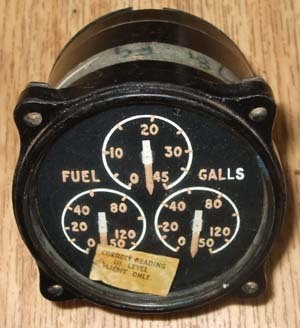 There are no examples of this aircraft left but the FAA museum in Yeovilton Somerset do have a partial cockpit. 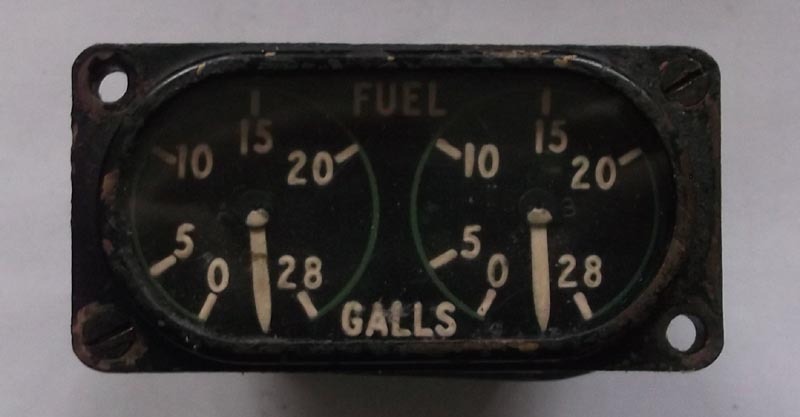 These fuel gauges are probably one of the only specifically made surviving parts of this aircraft left. The Barracuda was first used operationally in September 1941 in raids from HMS Victorious on Kirkenes in northern Norway and on Petsamo in Finland. 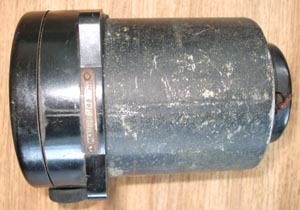 In 1942 Barracudas took part in sweeps over French ports and in the invasion of Madagascar. 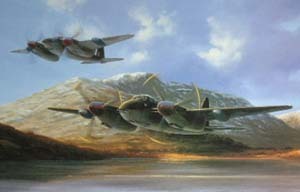 The first major action in which Barracuda squadrons took part was the successful bombing attack on the German battleship Tirpitz in Alten Fiord, north Norway on 3 April 1944. 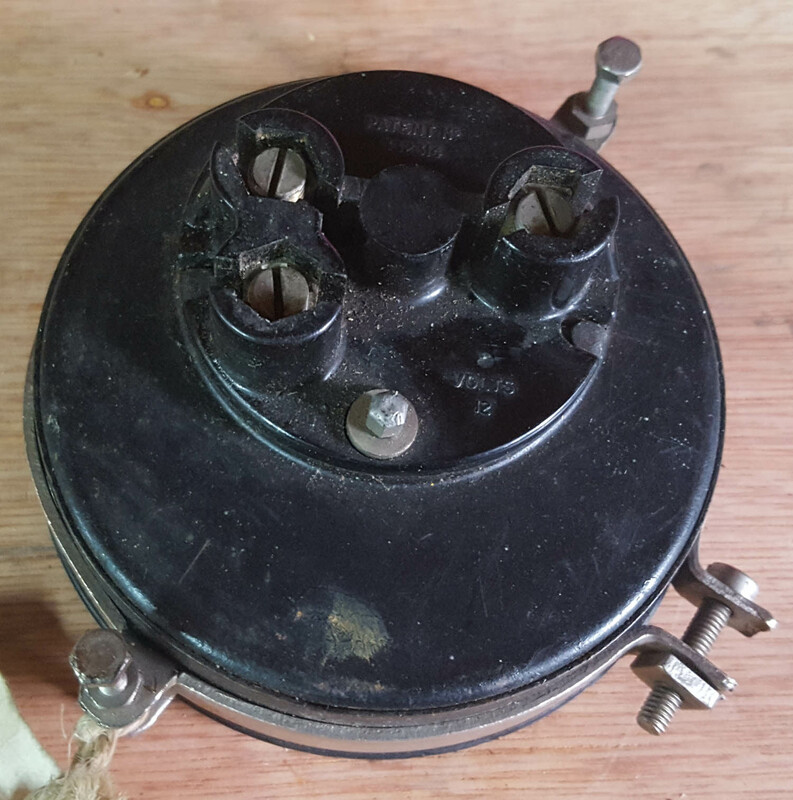 It was in action against the Japanese for the first time in an attack on enemy installations at Sabang, on the island of Sumatra on 19 April 1944. 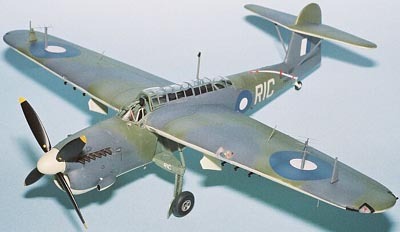 Shown above the Fairey Barracuda in RAAF colours. 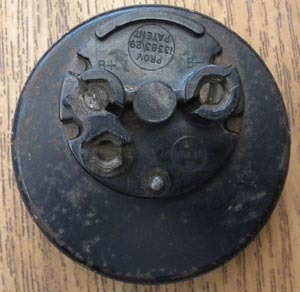 Here we have a fuel selector from a Boeing B 17 in very good condition.